June 2016: Roland's brother-in-law was visiting the farm and I showed him one of the 8-legged stools I had there. He recognized Roland's design and then asked if I'd ever tried to make any of Roland's milking stools. Many years ago, Roland gave me one of his milking stools. I thought it was a great design but it only had four legs so I wasn't that interested, I guess. And of all his designs, this is the only example that I possess. For all the others I needed to build my own if I wanted one. 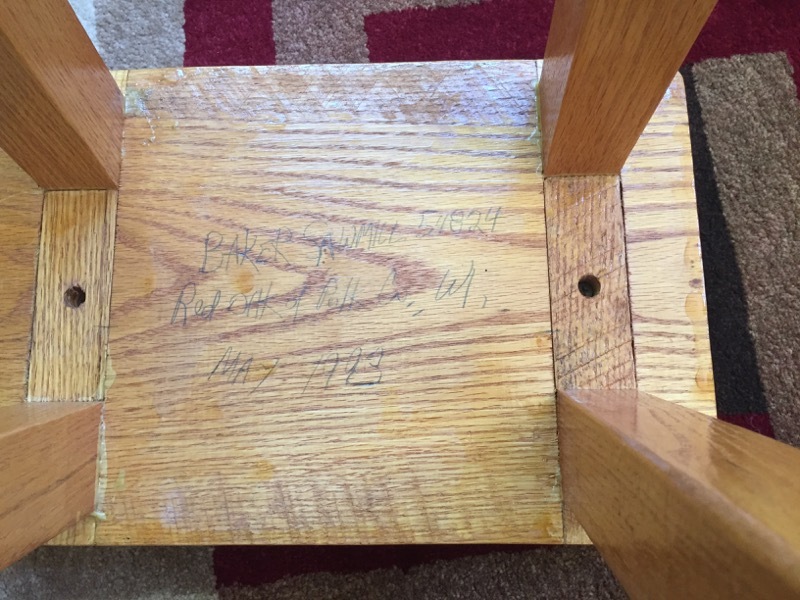 This stool has many angles to deal with. These angles are assembled to give the illusion that there are more angles than there really are, which is okay because there are plenty to deal with. 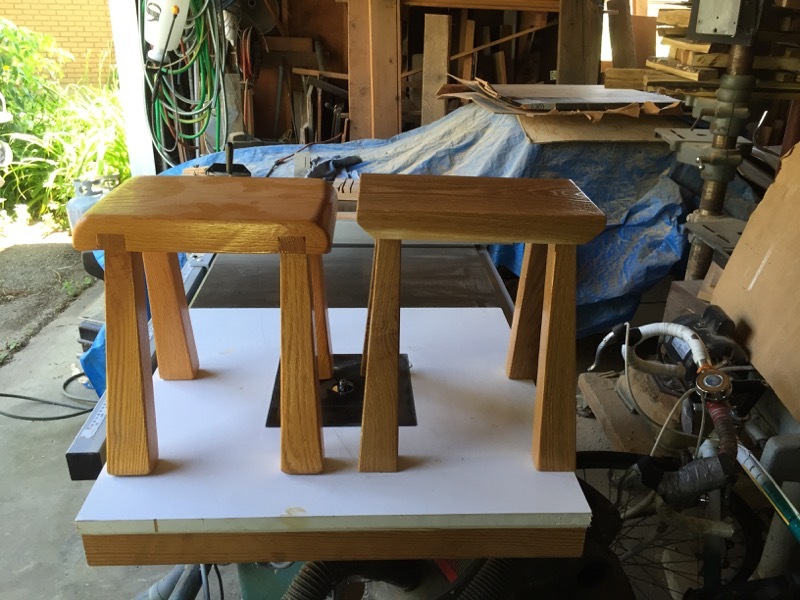 June 2016 Finished first copy of Roland's Milking Stool. My design was slightly different. Some of this was accidental. Some intentional. I was going to put a 45 degree bevel on each end to sort of match the rounding on the original. 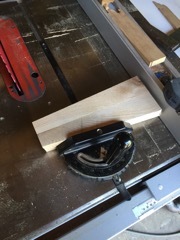 When I began the cut I noticed that I had the top upside down on the saw. Oops. Nothing to do now but to complete the cut and match it on the other end. I kind of like it this way. I think it gives the stool a Japanese sort of look. 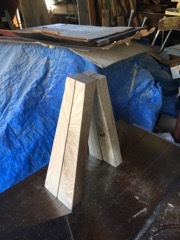 My only concern is that the bevel has reduced the amount of wood that is supporting the leg joint on the end..
My wife came out to the shop and asked where that stool went that was in the bedroom. I pointed to it sitting on my bench and explained that I needed borrow it to figure out how to copy it. I studied and studied. I thought and thought. I had to dig out my try-square to see what angles were present and which were just illusions. Here are two legs ready for cutting the top ends. 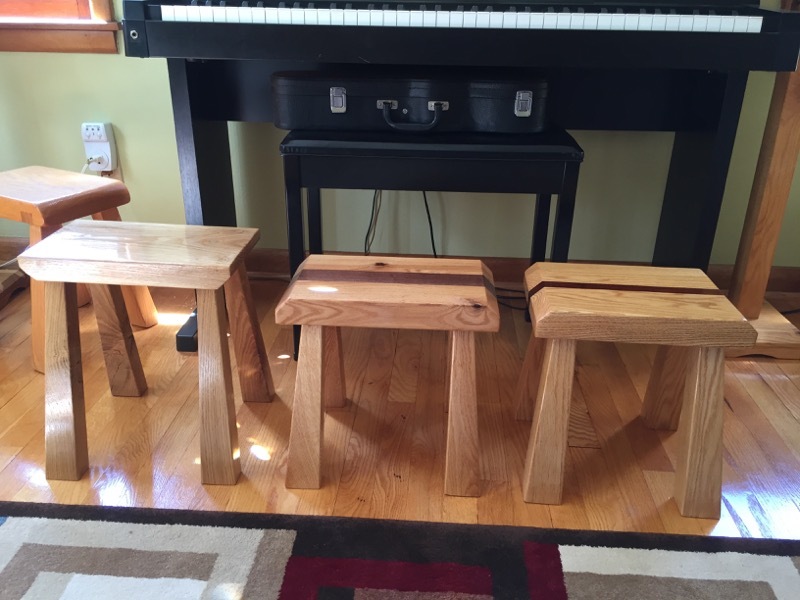 Here are the four legs with the angle cuts . The insides are 90 degrees and the outside edges are tapered 5 degrees off of 90. 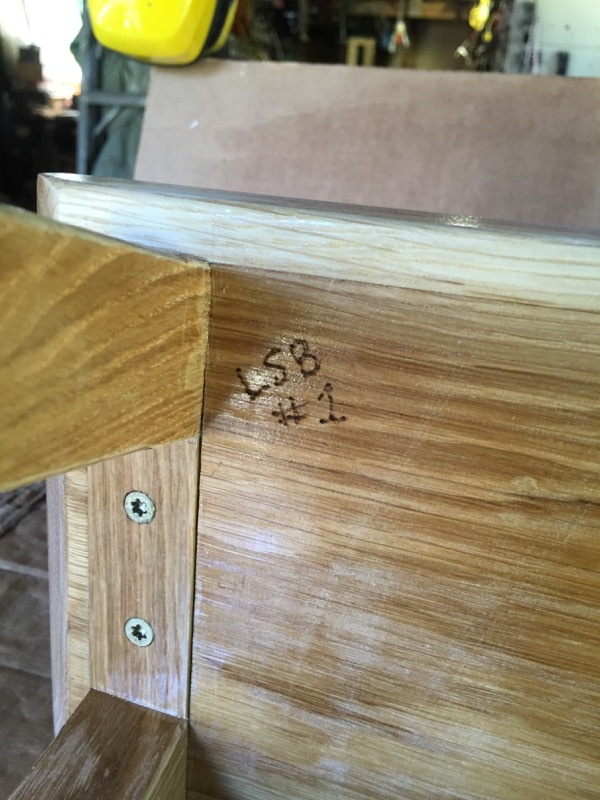 The top and bottom are cut to 13 degrees which creats the splay in the legs when they're mounted on the stool top. 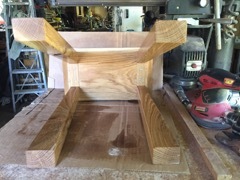 Bottom view of completed stool. Bottom view of the stool showing the attachment of the legs to the top. Roland's original design had plugs on the outside of the legs to fill in the mortise slots. I tackled this slightly differently. I cut off a slice from each side, cut the mortis slots in the center section and then glued the slices back on. This is a little tricky glue-up since the cut is at a 13 degree angle to match the outward flail of the legs. The pieces tend to slip when clamped. I solved this with more clamps to hold everything in line. 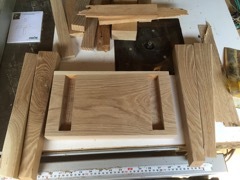 The only remaining step is to cut the inserts that will hold the legs apart and they screw them in the mortise. Finished stool, signed and numbered. After bringing this stool in the house I realized that it is the only piece that I have made out of White Oak. Not the only White Oak piece I've made but the only one that I still have. It has a decidedly 'greenish cast to the color compared to the Red Oak pieces. This is the model stool with Roland's signature. As with all images on this site, simply click on the image to view a larger version. 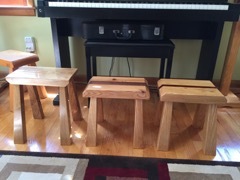 Here are the first three Milk Stools. As of July 2016, this is all that I have made. 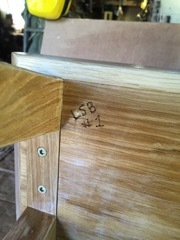 Here are links to the detail pages for the second and third stool.